The inside story of how Swedish politicians and activists introduced the idea of the Inter Party Cooperation on the Ugandan political scene. With a ruling party that had dominated the country for decades, leaders of the opposition knew that they would have to try something radically different in order to win the upcoming election. What they did was unheard of. The parties decided to form an alliance and to field one candidate against the sitting prime minister. Their reasoning seemed sound: together we are weak, but if we can present a united front that offers a viable alternative to the ruling party, we could win. And not just win but take a majority. They called themselves “The New Moderates” and over the subsequent months, the leaders of the parties came together to debate a common election manifesto and to decide on which leader would become the flag bearer. There were some bitter quarrels and occasionally there were risks that the alliance would fail. But they pulled through. They chose a youthful 41-year-old MP who entered Parliament at the age of 26. He was well spoken and had a keen ability to bring together people with disparate views. “For years we have experienced a lack of real opposition. Now we are showing the people that four parties with similar values and views can govern this country in the future,” said one of the leaders. And it worked. The Alliance beat the ruling party by two percent and soon after, on October 6, 2006, swore in their new Prime Minister of Sweden, Fredrik Reinfeldt. “In real democracies, governments change from time to time. That is what is happening here,” said Reinfeldt at that time. In the glow of their election victory, those who had worked hard to bring the different parties together had another radical idea: Perhaps this strategy could work in other parts of the world where one party has maintained power for long. One of the organizations to take up the cause of democracy in Uganda was the Christian Democrat International Center or KDIC, a non- profit organisation related to the country’s conservative Christian Democrat Party. KIC was already present in Uganda training women and young people on how to be active in the political process. But these projects seemed insignificant in a country where the ruling party has maintained power for over 20 years. They decided on a new tact: a political alliance. “The concept of an alliance between parties that successfully worked out in the election in Sweden in September 2006, could be a workable concept even in Uganda,” wrote KIC in a memorandum in 2007. Soon after, KIC Chairperson Rasmus Rasmusson visited Uganda to hold talks with many of the opposition parties. The parties, including FDC and UPC, were at the time receptive of the idea. After all, the Swedes were offering something they could not say no to: money. “Major opposition parties are in the process of forming an alliance. We would also like to appeal for support from Sida, International IDEA and the Swedish Riksdag (Parliament) in order to realize the much needed reforms,” stated a letter to the aforementioned groups signed by FDC Spokesperson Wafula Oguttu, DP Head of Communications Fred Mwesigwa and President of the CP John Ken Lukyamuzi during a fact-finding trip to Sweden in February 2008. Over the next two years, whispers of a cooperation spread through the political establishment in Uganda. Could it be that the outspoken leaders of these political parties would even consider working together? Even among the opposition, relations were not always cordial. They were not sworn enemies, but they were also not exactly drinking buddies. But after a huge defeat in 2006, it seems that the opposition was willing to consider the inconceivable and informal meetings began to take place with support from some western organizations including the KIC. The Swedes felt that as they had experienced, parties can come together under a single banner for the good of the country. But Uganda is not Sweden. 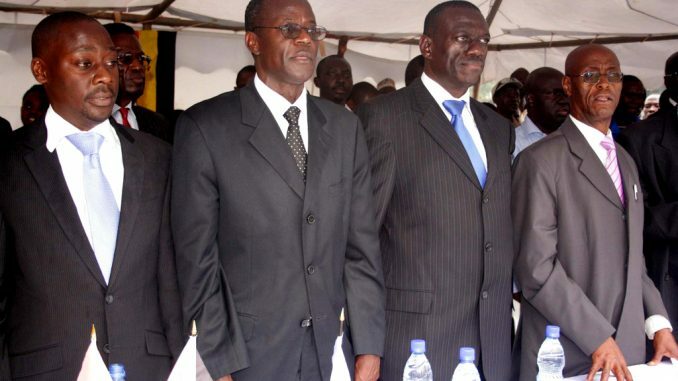 In August 2008, may of Uganda’s main political parties came together to sign the first protocol of the alliance, which became known as the “Inter-Party Cooperation” or the IPC. The participating parties included FDC, DP, JEEMA, CP and UPC. Miria Obote, then President of the UPC, was a supporter of the idea of a political alliance from the beginning. At an early meeting, Mrs. Obote stated that the idea of political alliance was not a new phenomenon and has been used in the past, including the Inter-Party Forces Cooperation (IPFC) formed principally between DP and UPC to support the candidature of Dr. Paul Semwogerere in 1996. “It is time for political parties to seriously reflect on the future of this country. It is now imperative for political parties in this country to cooperate and rescue our country from sliding into a completely failed state,” said Miria Obote. The party leaders were smiling and the meeting went on cordially. Donors, other than KIC, were getting on board and offering both logistical and financial support. All the while Ugandans were left to wonder if these political leaders, figures they have known for generations, were genuinely a political alliance for the good of the country. From the beginning, there was an underlying problem that threatened to derail the IPC: the runoff. According to the Ugandan electoral laws, when no party or candidate gets more than 50 percent of the vote, then there will be a runoff between the two leading candidates. Many members of the different parties expressed early concern that fielding one candidate against President Museveni would put them at a disadvantage. The argument went that each party was strong in different geographical areas of Uganda. Besigye’s FDC was considered to have much support in the North, the DP in Central and UPC boasted of support in the in the East. By backing one presidential candidate, say Besigye, the IPC would perhaps alienate voters in regions where Besigye was unpopular leading to Museveni gaining more than 50 percent of the vote. By not wasting time on the IPC and focussing on their own political campaigns, the argument went, the opposition could each garner enough support to bring the total above 50 percent, thus leading to a runoff. Museveni would then have to run against the second place finisher. If the opposition was able to break the 50 percent barrier, then it would be the voters who decide which candidate would run against Museveni. The parties were presented with a simple but unprecedented choice to reach that goal of breaking 50 percent: Unite and together campaign against the “oppressive” rule of the NRM or campaign separately and secure support in their respective regions. The IPC decided for the former. Without DP (party leaders decided that only their members could decide whether or not to join the IPC through a delegates conference), on December 16, 2009, IPC party leaders stood up before a throng of cameras, clutching each other’s hands raised up in a triumphant sign of solidarity. “This occasion today is meant to re-energise and consolidate our resolve to provide new political leadership and direction to our nation to cause positive change by the power of the people,” said UPC President Miria Obote after the announcement. Donors, such as Lennart Karlsson, a representative from the Centre Party in Sweden who was present at the signing, hailed the opposition for this achievement, and likened it to what they had done in Sweden. “This decision shows your determination to overcome short-sighted power struggle between the parties, to be able to show the citizens of Uganda that you want to foster a new political way, with the people rather than the politicians in focus,” said Karlsson. Such a display of unity was a rare site for Ugandan politics. But the question remained as to whether the alliance would hold. “We fought UPC and they must be now regretting their mistakes. But DP has not learnt from history where problems of Uganda emanated from. Now you hear they have formed a coalition to fight NRM. They have formed an alliance with the past killers (UPC) in IPC (Inter Party Cooperation),” Museveni said. Museveni’s strategy appeared to be to stoke the same divisions the coalition was coming together to overcome. With the DP delegates’ conference scheduled for the following month, the President found it necessary to attack the DP and diminish its perceived influence in Central and Northern Uganda. “Forget DP. It’s in disarray. 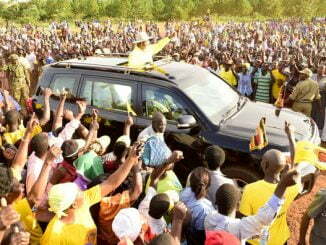 Join NRM which liberated the country and has provided a shield for stability,” said the President. By bringing up the history of the different opposition parties, Museveni shone a light on one of the main weaknesses of the UPC: the past. UPC has failed to distance itself from Milton Obote, a man who was an incredibly divisive figure in much of Ugandan politics since independence, especially in Central Uganda where his abolition of kingdoms in 1967 led to the exiling of the then Kabaka of Buganda Edward Muteesa. And any association with the UPC could affect the success of the IPC. The FDC, made up primarily of figures who left the NRM, is less susceptible to such criticisms. 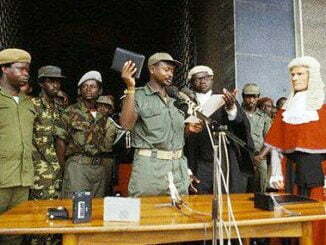 What was clear in those statements was that Museveni was going to continue to use the political strategy that has helped him maintain support over the past two decades by reminding Ugandans that he went into the bush to liberate his people. The campaign would be a battle between change (IPC and DP) versus more of the same (NRM). Now it was up to the IPC and the DP to figure out what this change was going to look like. And in February, the Democratic Party overwhelmingly decided that their candidate for change was going to be Norbert Mao, the enthusiastic and popular Chairman of Gulu. Chances of DP joining the IPC began to fade even further. Then in May, the DP made it official. They would be going it alone. “The national executive committee of the party has critically examined the IPC protocol and decided not to join the IPC in its current form,” the party said in a statement. “With so many parties fronting presidential candidates, President Yoweri Museveni will get confused and we shall beat him,” Mao said. Mao’s decision was a huge blow to the IPC. In March, the Uganda People’s Congress elected former United Nations Under-Secretary General and Special Representative for Children and Armed Conflict, Dr. Olara Otunnu to be the President of the party. Having just returned to Uganda after almost 20 years in the US, Otunnu was perceived to be a uniting figure that would give a new voice to the UPC (his main challenger was Milton Obote’s son Jimmy Akena) and a candidate that would have international credibility. But Otunnu did not have the effect for the IPC that supporters had hoped for. From the beginning, there was grumbling in the UPC that Besigye was using the IPC to further his own political ambitions and those of his party. Many observers knew it was only a matter of time before such disagreements came to the fore. Then last month, the IPC lost its second major party as Otunnu announced that the UPC would not be continuing as a part of the IPC citing the country’s inability to confront its past and his stance that the 2011 elections should be boycotted until a new Electoral Commission is put in place, something the IPC has refused to do. “It is, therefore, with a heavy heart and much sadness that after very careful review, I have to say that UPC is unable to continue working with the IPC,” said Otunnu. A week later, the IPC nominated Rtd. Col. Dr. Kizza Besigye to be the flag bearer for the 2011 election. He will be facing Museveni for the third time. Ugandan politics works. It seems they have learned a lot over the last two years. 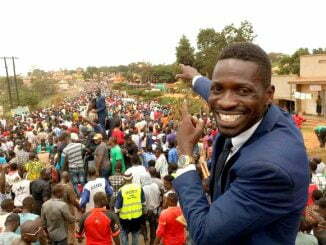 So the field is set and the candidates have started trekking around Uganda campaigning for support. Though unlikely, talk of cooperation continues and whispers of a UPC-DP alliance are starting to get louder. Welcome to Ugandan politics.